Back in July 2011, there was a Kickstarter Project for ‘Red Pop’. Named after the red headed photographer father of one of the designers, the project successfully funded at over double the requested funds. The hardware was pretty nifty. It snapped over the connector end of an iPhone 4 body, providing a large shutter button when using the specialized photography app. Recently, I visited the site that was selling/shipping the Red Pop, Beep Industries. Interesting, the site says the company has shut down. Yet, the rest of the products the group offered, iPhone/iPad stands, is now available called Everything Beep, near same logo, but no Red Pop. 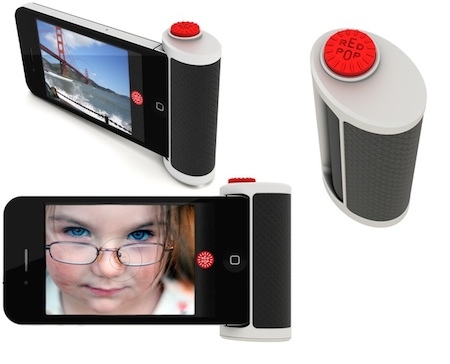 What brought Red Pop to mind was when I found another iPhone camera grip on Kickstarter. Snappgrip is less about cute fun and more about mimicking the look and feel of a camera. The project is already successfully funded but wont end till January 28th so at the time of this writing there is still time to get in at the pre-order lower pricing. Though, the project is out of the UK so funding is not in US Dollars and the system requires a credit card rather than payment through Amazon like the US Kickstarter projects. The Snappgrip doesn’t snap onto the raw iPhone to use the sync connector. Instead, the handle attaches to a case for either the iPhone 4 or 5 communicating via Bluetooth. It also carries a rechargeable battery charged through a micro USB connector on the bottom next to the stand by switch and tripod mount. The controls on the handle allow for half press focus, full press shutter, flash on/off and zoom. 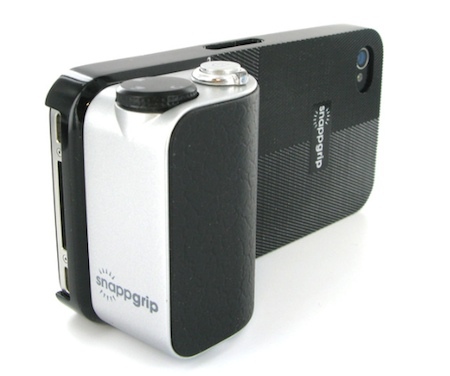 The Snappgrip seems like a nice add on device for the serious iPhone photographer. I’ll do a follow up review when I have one in hand to use around town.